After five weeks, I finally managed to open my art journal and create a page. This was thanks to me actually being able to go along to my art journal meet up group for the first time in months. I decided to use the most recent Colour Me Positive art journal prompt as my jumping off point. The prompt was the theme of “new beginnings”. There are a lot of ways I could have chosen to interpret that prompt, from the personal to the more expansive and profound. I chose, however, to think about the regular beats of life, its cycles and rhythms, and the idea of each passing day being a new beginning came to mind. I decided to illustrate a winter sunrise. 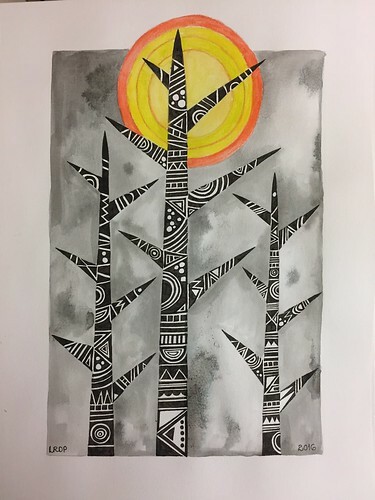 I was actually going to keep the page monochromatic, just shades of black and grey, but one of the other ladies at the meet up suggested I add just a splash of colour to the sun so I added some yellow and orange. I cannot decide if that was a positive step to take or not. I think maybe yellow would have looked nice against the greys but not so much the orange. But such experiments are precisely what an art journal is handy for. I have not opened my art journal in over a month. Any free time I have had to spend on art has been rationed for tackling some Life Book or Let’s Face It lessons, my 100 Faces project, or Inktober drawings. There has been no time going spare for just playing with materials and ideas in my art journal. After a couple of intense weeks of being over-scheduled and no real end in sight before Thanksgiving break, I decided I needed some creative play in my art journal just to decompress and recalibrate bit. 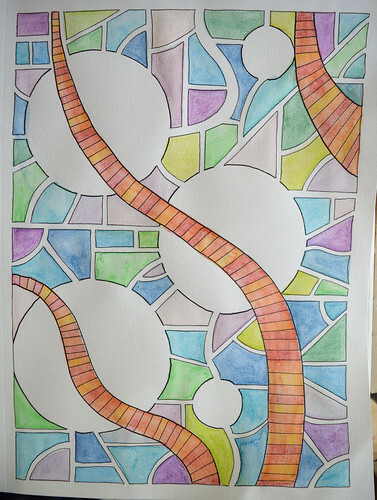 I looked at the two most recent Colour Me Positive art journal prompts for inspiration. One of them was about Dreaming and Dreams and one was about Laughter and Joy. Those seemed like the right sort of positive qualities to focus on. 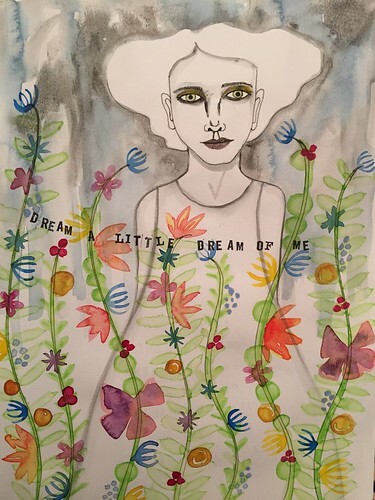 I decided to just start drawing and splashing ink and watercolour around and see what emerged on the pages. Perhaps because I have been working on my series of faces, in both instances it was a face that emerged first and then the pages evolved from that starting point. While visually it does not relate much to the theme, I quite like the way the Dream page turned out. The page with the smiling figure, however, went pear-shaped early on with the placement of the hands. I thought I could maybe fudge those and still pull the page together but then another “cat collaboration” happened. Peanut the cat decided to stroll across my page, right through some yellow paint, smearing it right across the face. A jaundiced face was not part of my plan. I kept adding to the rainbow around the edge of the figure, pulling the shape out as a negative space, while trying to decide what to do about the smudgy yellow face. The face, quite frankly, was a little creepy even before the cat’s contribution. 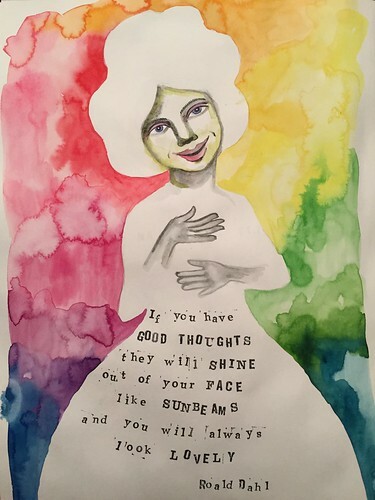 Then I remembered the Roald Dahl quotation about good thoughts shining out of a face like sunbeams and thought maybe I could use that as an excuse for the yellow cast to the face. That quotation got stamped on and the page was complete. Not a success in any aesthetic or artistic sense but I played in my journal for long enough to complete two pages so that was a score for creativity. It has been a few weeks since I did anything in my art journal. Life just got crazy busy and my free time has all but vanished – more of which at a later date – and what time I have had has been used to try and keep on top of my art courses. My poor art journal has been neglected. When this week’s Colour Me Positive prompt appeared, however, it was the shove I needed to actually open the journal and do something. The result was my quickest journal page ever. This took me five minutes. That’s it. Five small minutes. And the page shows the total lack of investment and effort. Ha! But that is OK because at least I opened the art journal and did something. 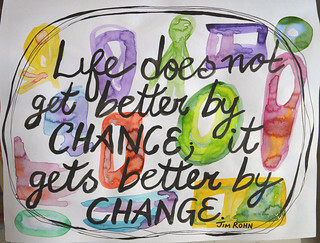 The theme was Change and the quotation was “Life does not get better by chance; it gets better by change”. I googled and it turns out it is from some motivational speaker named Jim Rohn. It is a little bit trite for my taste, the phrasing at least, but I a) agree with the concept and b) did not have time to contemplate an alternative so I decided to use the quotation. I had a page in my art journal where I had been experimenting with watercolour, testing out how the pigments would mix, run together, and what the resulting puddles would look like once dried. Just random shapes and marks all over the page. I thought I might repurpose it eventually but with no idea when, how or why. 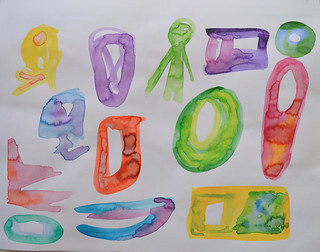 So why not just write the quotation over the top of the watercolour blobs? After all, transforming the purposeless page would chime with the theme of Change. So I shoved a paint brush into a bottle of India ink, scrawled the quotation across the page, roughly encircled it with a thinner brush in the same ink. Five minutes maximum. Done. Not very arty or creative but job done. And maybe now I can get back in the habit of cracking open the art journal at least once a week again. This week’s art journal page is going to take some explaining. The Colour Me Positive prompt was “best”. I was a bit stumped and was letting the idea of best rattle around in my head for a bit and then I thought of the idea of being the best possible version of me by being a bionic me. Immediately I got excited about the idea of drawing me as a version of the Steve Austin. I would be the Six Million Dollar Laura complete with a natty 1970s jumpsuit. However, I have been doing a lot of illustrating in my journal of late and thought maybe it would be an idea to try something different. So then I thought about just illustrating the wiring and circuitry of a bionic person. Except I don’t get too excited about technical drawing. So then I thought about turning the idea of the circuitry and robotics inside a bionic person into an abstract pattern. I happened to be working on this journal page when I was with my art journalling meetup group. We meet in a coffee shop so there are limited resources and a need to avoid making a complete mess. I just had my travel art kit with me too which limited my options for media. Sometimes that is a benefit though as it helps me narrow my focus and just get on with it. This was drawn using pencil and then filled with watercolour pencil which I then activated. Once that was dry, I used micron pens to outline the shapes again. I liked playing with all the negative spaces and turning my circuit board idea into a sort of visual mosaic. It was the perfect page to work on while I was with my art group as it didn’t require much in the way of concentration so then I could chat and look at other people’s art work. I still have that Bionic Me idea rattling around in my head, however, so I may just have to illustrate that at some point. Last week’s Colour Me Positive prompt was “Possible”. I was so busy with the kids all week that I had a few days to let the concepts of possible and impossible rattle around in my head. Flicking through my art journal for inspiration, I had my epiphany when I saw my recent Cheshire Cat page. 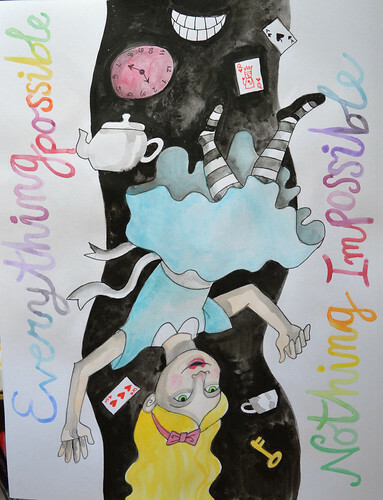 Since Wonderland is all about the impossible becoming possible, I decided to draw Alice falling down the rabbit hole. Once I finally had my idea it was fairly quick and easy to execute by breaking it down into three quick stages: drawing with a fountain pen, painting the rabbit hole with black ink, adding colour using watercolour. The sides of the page were looking glaringly blank and I toyed with the idea of painting them in but opted to use it as an excuse to practice writing with watercolour. After two weeks of travelling and zero time for art, picking up my art journal again was a great means of getting back into a creative groove and add oil to the old and creaky art joints. The Colour Me Positive prompt for last week was “Alive” so I decided to create a page on that theme. 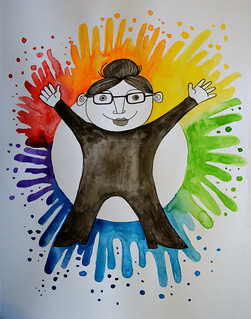 The wee me character is one I previously featured in an art journal page for the theme of “Balance” and it was fun to feature her/me again in this page. Alive made me think of vivaciousness and zest for life, diverse experiences, just the essence of vitality. That was when the image of a figure leaping from a ring of rainbow colours entered my mind’s eye. I am sure you spotted the mistake. When adding watercolour into the ring encircling the figure, I let the yellow wander beyond the interior circle shape. Doh. Guess I need to add more oil to those rusty creative joints still. This week’s Colour Me Positive theme is “Smile”. 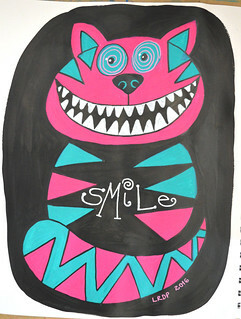 I instantly knew what I wanted to create in my art journal: a Cheshire Cat. I have always found the story of Alice’s Adventures in Wonderland to be pretty sinister. Even when I was wee and had no wider context or understanding of its themes and motifs, I found it creepy. This was in large part down to the fact that my copy of the book had been my mother’s and had some pretty creepy illustrations accompanying the text. It was also somewhat foxed and smelled faintly of mildew. The things is though that what I really appreciate and enjoy about Wonderland is that it is both amusing and scary, ridiculous and terrifying, joyous and creepy. That teetering on an uncertain fulcrum, that tumultousness, that sense of trepidation, is actually what continues to engage me in the book and its themes – though I have not actually read cover to cover it in almost 20 years. It is the Cheshire Cat who most clearly, to me anyway, represents that sense of pivoting between the zany, wacky fun side of Wonderland and its threatening, intimidating, dangerous underbelly. The Cat seems caring but can be cruel. He is wicked and wickedly fun. He’s a riddler and a trickster. He is chaos. He is an absolutely wonderful creation. I wanted my illustration of the Cheshire Cat to embody his bright spirit and his darkness so I chose to paint him part way through once of his disappearing acts. I like the way the black makes the candy pink and turquoise paints pop. I think he looks mischievous and manic because of that tooth-filled grin and the wide eyes. I am rather pleased with that. My 10 year old declared this to be my best page in my current art journal. High praise indeed.